I love these earrings. The color is quite unusual and very lovely. I think that what I like about; they feel unique. The quality is great. Very well made. An artful mix of stones in different cuts and sizes guarantees thatthese earrings will be among the most interesting in yourcollection. The intentionally rough cut of the gems offers a newway to experience the beauty of these stones. Adding butterygoldplated for a hint of shine ensures the earrings also convey apolished look. Story Behind the Art: Sitara Collections was born from founder Linda Singh's passion for artisan-created goods, and a determination to offer thoughtfully made items rather than mass-produced pieces. With workshops in Delhi, and Jaipur, Sitara Collections employs approximately 25 makers creating a range of jewelry as well as leather pieces. The women who make the jewelry have all been able to learn new skills, while the men who make the leather pieces utilize techniques that have been passed down generations. Linda is proud that the stones used in their jewelry is all ethically sourced, and that their leather is colored using vegetable dyes. An even larger source of pride is that by working with Sitara Collections, the makers Linda employs work in clean, safe environments, and are paid a fair wage that makes it possible to support themselves and their families. Being based in India, it was important for Linda to give back. So Sitara Collections started the Shiksha Vikas Vidyalaya School in the small village of Chanchali. The school provides after-school programs designed to supplement and enrich students' education in the areas of mathematics and English in order to give them a head start and help them forge a new path for their lives. Nicely made earrings, but the lower larges stones in the set I received are deep dark blue, nothing like the pretty silvery look in the photo. This makes them almost identical to another set I ordered where I wanted the blue, so I have to send one of them back. These earrings looked so nice in the picture that I was planning to wear them with several outfits -- very disappointing! I can't recommend these - you'll have no idea what you're going to get. The stones are absolutely exquisite, and I really love them. The gold plating however is very "yellow" and unfortunately due to this, I will return them. I still gave them 5 stars, as people liking gold, would likely not mind. I'm not big on gold in general, but the platings differ in intensity, and this one was too much for my taste. I do wish I could keep them though as the stones are gorgeous. 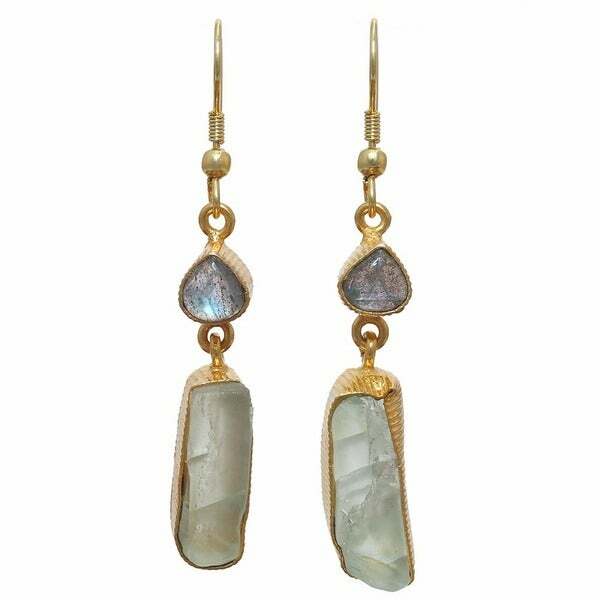 I ordered these earrings on a flash deal excited for my guest Labradorite piece. They are smaller than I expected and I decided to save them and give as a gift. Bought these on a whim to go with a dress that was given to me as a gift. Neither were items I normally would have purchased but they go together beautifully. The earrings have nice color and the setting looks like it will hold up well...substantial but not at all heavy. Comfortable to wear. Very stylish! I like the craftsmanship and the coloring. Pretty much able to wear with just about everything, and so glad I know I was making a conscious purchase. The earrings are pretty, but will not hang facing forward due to the weight on my ear. I love the stone color and wish I could see them facing forward. They are on-trend and I wear them often. I am considering looking for some sort of backing so they can hang from my ear better. These earrings are quite pretty, look pretty much like the photo - I saw another review that stated they were darker blue that shown, and as mine were not I suspect each set is slightly different. Well made. Beautiful and unique looking earrings! They aren’t too long or too heavy but look very classy and expensive! My mother-in-law loved them! Great purchase. These earrings are delightful! The Clor is amazing and ever changinging! They look much more expensive than they are. This stone-Labradite-is known for its healing and protective properties--a plus! The earrings are cheap. Would not purchase again. I love the different colorful stones very unique. Just love it. I just like the look.